Part of our CSA basket last week was 2 small heads of baby cabbage. When I think of cabbage, there’s two things that come to mind…sauerkraut and coleslaw. I have never made sauerkraut before, but it’s on my list, one day I’ll tackle it. So the next best thing was to make a batch of coleslaw. 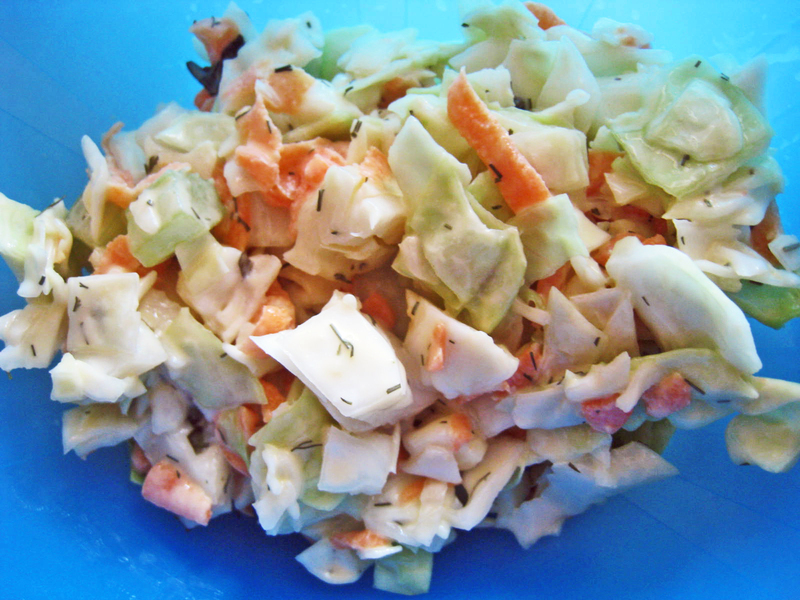 My grandmother made amazing coleslaw dresssing growing up. She never used a recipe but it was always perfect. Before she got sick, she wrote the recipe down for my mom. We have both attempted to duplicate the dressing, but we can’t get it right. I’m still on the hunt for a dressing that’s similiar to it. Instead of trying to figure it out, I decided to go in the opposite direction – an herbed dressing. This was a quick recipe, perfect for a hot summer night – just like what we’ve been experiencing for the last 8 days. Needless to say, I haven’t done much cooking and baking. In a large bowl, combine the cabbage, celery, carrots and basil. Sprinkle with salt and toss to combine. In a small bowl. combine the mayo, dill, vinegar and pepper. Add to the vegetables and toss again. Chill for at least 1 hour or longer before serving to allow the flavors to blend. It's always so sad when wonderful family recipes are lost. It makes me realize how important it is to not only feed but cook with my daughter so that she will know how to make her favorites when the day comes that I can no longer make them for her.